* CAAMA: Leading human rights advocate says disenfranchisement of Australia’s First Nations Peoples continues! 6 Dec 12: "The family of Kwementjaye Briscoe, a young Aboriginal man killed in custody in the Alice Springs watch house on January 5 this year, will rally alongside supporters on Human Rights Day to demand justice and that charges be laid against police officers responsible for his death. Kwementjaye Briscoe was taken into custody for public drinking on January 4. CCTV footage shown at the coronial investigation shows police officers assaulting Briscoe before leaving him bleeding and unconscious, lying face down in a cell where it was later concluded he died of positional asphyxiation. The Human Rights Day rally starts at 4pm on December 10th on the Alice Springs court house lawns." "On 4 January 2012, my nephew T. Daniels Briscoe died in police custody. ... The Coroner’s findings are, in our view, sufficient for the Director of Public Prosecutions to investigate and pursue charges for negligent manslaughter. On behalf of our family and community, I’m asking for charges to be laid against police for what was done and for real changes to be implemented, rather than empty words. Please sign the petition, and encourage everyone you know to help and lend their support." 5 Dec 12: "Stop the Intervention Collective Sydney (STICS) is holding a forum this Thursday night, December 6 to mark the United Nations' Human Rights Day. Speakers will also reflect on the twenty year anniversary of Paul Keating's famous "Redfern Speech", which recognised the horrific impact of colonisation on Aboriginal people. The forum, starting 6:30pm at the Tom Mann Theatre (136 Chalmers St, Surry Hills), follows the release of a comprehensive evaluation of the income management system last week which provides clear evidence of ongoing and systematic discrimination against Aboriginal people. Rosalie Kunoth-Monks OAM, a senior Aboriginal Elder from the Utopia homelands in Central Australia, will address the forum, demanding the repeal of "Stronger Futures" legislation. These laws continue the imposition of the Northern Territory Intervention for a further ten years. Mrs Kunoth-Monks says that the NT Intervention is a return to the colonial-style policies Keating spoke against, and has done enormous damage to her community. "What this is about is our survival. We have been traumatised by the NT Intervention. The decision to continue with these policies under 'Stronger Futures' for a further ten years must be immediately reversed." ... "
to stop the national expansion of income management. 6 Dec 12: "Over 100 people attended the forum held to commemorate Human Rights Day, where speakers say there’s continued discrimination against Indigenous Australians in the Northern Territory because of the 2007 Intervention and local indigenous people saying such actions were a disaster. The Intervention ... has been continued under Julia Gillard with the 'Stronger Futures' Policy, which extends the Intervention in remote NT towns by ten years, ... Stop The Intervention Collective argue the new laws are a travesty. 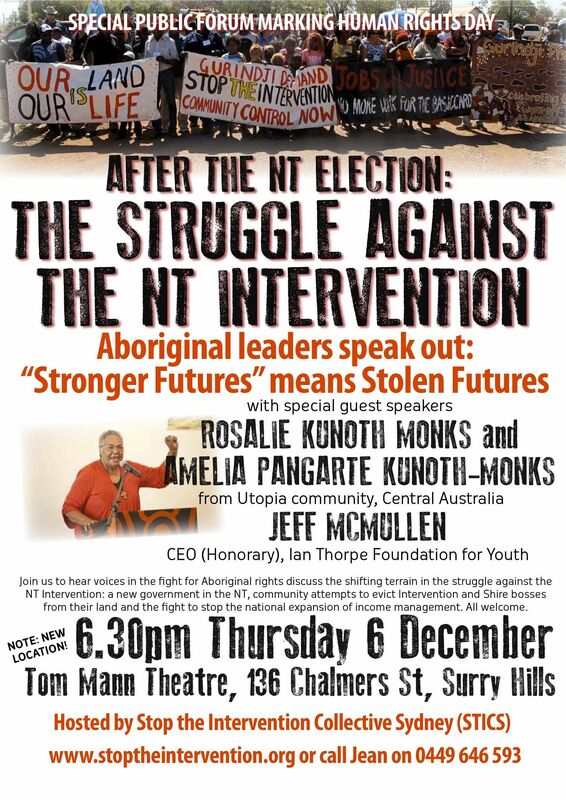 Aboriginal Elder, Rosalie Kunoth-Monks told the forum of the first day of the Intervention." 6 Dec 12: "NATIONAL: On the eve of the 20th anniversary of Paul Keating’s famous Redfern speech, an Aboriginal elder from Central Australia says the country has learnt little. In his stirring December 10, 1992 address on Aboriginal injustice, Mr Keating called on non-Aboriginal Australians to open their hearts and recognise they had dispossessed Aboriginal people and smashed their way of life. On Thursday, Rosalie Kunoth-Monks, an Aboriginal elder from the Utopia homelands, will reflect on the former prime minister’s words and the passage of time at a Sydney Human Rights forum." Remembering the Redfern Speech 20 years on. of European settlement on Indigenous Australians. what it means to be Australian in 2012.
and respect and looking towards the next 20 years." community wants to respond to the proposed changes"
A campaign coalition including Aboriginal leaders from the Northern Territory, major trade unions and community organisations will hold a press conference in Paul Keating Park, Bankstown on Friday to respond to moves by the Commonwealth government to further expand the income management scheme. The press conference will be addressed by Rosalie Kunoth-Monks, a senior Aboriginal Elder from Utopia in Central Australia. Her grand-daughter Amelia Kunoth-Monks has lived on income management and is preparing a complaint to the Human Rights Commission saying the scheme is discriminatory. Also speaking is Steve Turner from the Public Sector Association (PSA), representing child protection workers who are refusing to place people on income management. He will be supported by Unions NSW deputy secretary Adam Kerslake. Last week the Commonwealth released a comprehensive evaluation of income management in the Northern Territory which found overwhelming evidence the system is discriminatory and no strong evidence the program had improved lives when applied compulsorily. Despite this, the government is pressing ahead with plans to force new categories of people onto the scheme. ... "
Say No to Government’s Income Management: Not in Bankstown, Not Anywhere! 7 Dec 12: "The Stop the Intervention Collective calls for the Commonwealth to abandon the system of compulsory Income Management, following the recent release of a damning evaluation report. Pam Reilly talks with Paddy Gibson." 7 Dec 12: "A LOCAL woman has branded the Strategic Indigenous Housing Infrastructure Project (SIHIP) a disgrace and has called for an inquiry into the failed scheme. Valda Shannon says Aboriginal people were better off before the $36.5 million housing project which promised to transform the town camps into ‘modern suburbs’ of Tennant Creek. "I remember very well all the big talk," she said. "We all thought we were going to be living in some kind of luxury. "But it has turned into one big mess with all kinds of health and safety issues."" * CAAMA: LEADING HUMAN RIGHTS ADVOCATE SAYS DISENFRANCHISEMENT OF AUSTRALIA'S FIRST NATIONS PEOPLES CONTINUES! Leading human rights advocate says disenfranchisement of Australia’s First Nations Peoples continues ! 7 Dec 12: "A peak Australian Human Rights body says Aboriginal and Torres Strait Islanders hold a unique and special position as First Nations peoples and as such deserve proper constitutional recognition. ... HUGH de KRETSER from the Victorian based Human Rights Law Centre who has a reputation as one of the countrys leading human rights advocates says that Australias disenfranchisement of its first nations peoples continues today. with mortality rates the high rates of disease, alcohol abuse and smoking all a consequence of this!" 5 Dec 12: "The National Mental Health Commission has called for the mental health of Aboriginal and Torres Strait Islander people to be made a national priority. ... In its first annual report card it has recommended the mental health of Indigenous Australians be added as a target to the Closing the Gap program to reduce early deaths and improve well-being. The National Mental Health Commission's first report card includes a feature on the emotional and social well-being of Aboriginal and Torres Strait Islanders, in a bid it says to have the Indigenous community heard." Dr Thalia Anthony - Senior lecturer of Law from University of Technology Sydney"
7 Dec 12: "The Western Australian Greens are encouraging Aboriginal groups who haven't yet applied for Stolen Wages reparation to push for the deadline to be extended. The application deadline for the WA Government's scheme to pay $2000 to Aboriginal people who had their wages withheld up to the 1970s has now expired. Indigenous Affairs Minister Peter Collier has ignored calls for the date to be pushed back. Greens communities spokesperson Alison Xamon says the Government hasn't done enough to inform people of the scheme, especially in remote areas." 7 Dec 12: "NEW SOUTH WALES: The New South Wales Aboriginal Land Council has sought an urgent review of a decision by the Office of Environment and Heritage not to pursue the full force of the law over the destruction of Aboriginal rock engravings on Sydney’s north shore. NSWALC, the state’s peak Aboriginal organisation, recently highlighted the alleged actions of Ausgrid for what appears to be blatant destruction of this sensitive Aboriginal site at Cromer, in it’s magazine Tracker. ... NSWALC believes the company should be prosecuted under section 86 (1) for knowingly harming or desecrating an Aboriginal 'object.'" 7 Dec 12: "Elders who have told protestors at the seven-month-old Brisbane tent embassy to pack up the site have been met with resistance. As a result of growing violence and rubbish, the elders told the council that the tent embassy and accompanying signs would be removed from South Brisbane’s Musgrave Park. ... elder Judulu Colin said the site is in good shape and is calling on the Lord Mayor to show leadership." The e-newsletters include media releases, opinion pieces, news items and events. Subscribers can expect to receive about 5 e-newsletters each week.